Outdoor advertisement and branding relies heavily on front-lit and backlit flex printing. Glass Signage is an extremely cost-effective way to get your advertising message across. 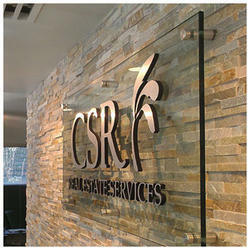 Glass signs present a clean, upscale, refined image of your business. For centuries glass has been used in creative ways to express wealth, grandeur and refined taste. Hooks are provided at the back for hanging this on a wall. This product is available for sale on our official website. We are one of the most well-distinguished companies in the market that are into offering Glass Sign Board. We are offering Sign Boards to our client. We offer Glass Signage Board. Banking on the skills of our qualified team of professionals, we are instrumental in offering supreme quality range of Glass Signage. We have marked a unique position in the domain by offering a wide gamut of Fancy Glass Office Sign Board to our respected customers.